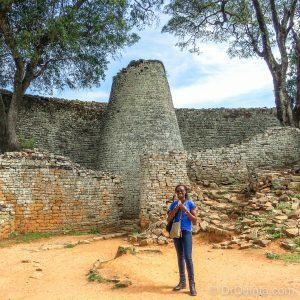 Great Zimbabwe is a complex of stone ruins found in southern Zimbabwe, near the town of Masvingo. I was privileged to visit these magnificent ruins a year and a half ago. The name “Zimbabwe” is thought to mean “house of stone” in the Shona language. Great Zimbabwe dates back to the 11th century although the site was occupied as early as the fourth century AD. The ruins are divided into three groups: the Valley Ruins, the Hill Ruins, and the Great Enclosure. The Hill Ruins are built into naturally occurring granite boulders to camouflage the stone settlement. The kings were thought to live in the Hill Ruins while their wives lived on the Great Enclosure. As is the case with similar ruins around the world (Machu Picchu, Chichen Itza, etc), the stones are not joined with mortar. Archeological findings of glass, porcelain and coins suggest that Great Zimbabwe traded with China, Persia and the Arab world. The city supplied gold and ivory in return. At its peak, the city housed over 18,000 people and spanned 1800 acres. The city was abandoned around 1450 due to lack of resources brought on by overpopulation and deforestation. The ruins are of great importance to the national identity of Zimbabwe. Soapstone carvings of the fish eagle found at the site are depicted on the flag of Zimbabwe. The tower at Harare International Airport is designed after the tower in the Great Enclosure. Have your hotel or lodge help you organize a tour. I had difficulty finding any tour companies online. The ruins are near Masvingo, which is about a 4-hour drive south of Harare. There is a hotel near the ruins where you can spend the night. I chose to return to Harare on the same day so I rode in the car for 8 hours that day. Plan accordingly. It takes at least 3 hours to tour the ruins properly, and you are exposed to the sun for much of that time. Take plenty of beverages, and start the tour as early in the day as you can. Until next time, live young and travel!